I like to be a food tourist, which usually means looking for foods that are traditional to the place I’m visiting. Yesterday was Italian food, and it was maybe the best lasagna I ever had. Today I went Kosher. 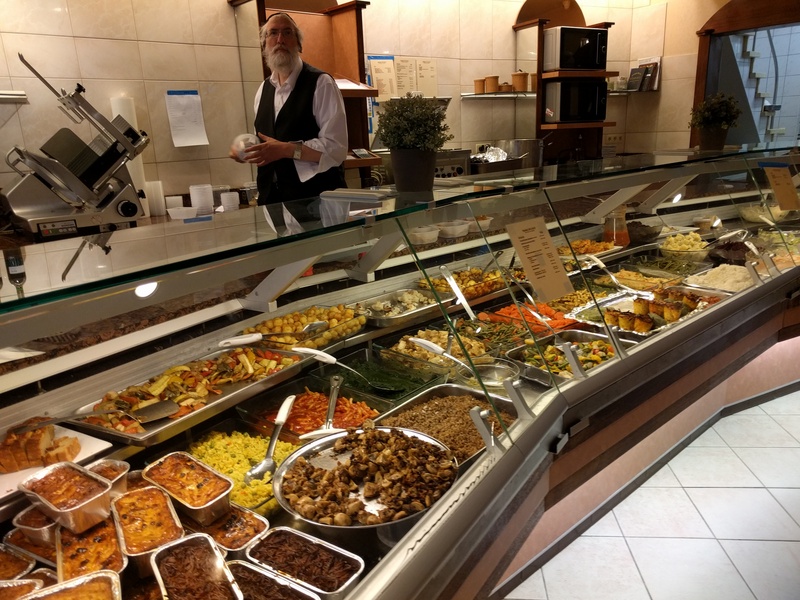 I went to Spotted by Locals and the first listing was for Hoffy’s Yiddish Restaurant down in the Diamond District, about a 15‐minute walk. Well suffice it to say, Hoffy’s did not disappoint. I couldn’t begin to pick, so I had them make me a starter plate and a main course plate. It may not have been the best meal I’ve ever had, but it is a meal I will never forget. And that’s what vacation is supposed to do: provide memories of food I will never forget. I did other things today. I started with an adventure. I went to a market down the street to get something for breakfast, and they were closed, so I walked down the block and found another market. I got some yogurt and paid and walked out and was completely lost. Oh, and I’d gone out without my phone and without my Antwerp map. I couldn’t begin to understand how I’d gotten lost, but nothing looked familiar. I tried backtracking, but I couldn’t find the grocery. I started thinking I’d be stranded forever in Antwerp, wandering the streets, unable to find my way home. Finally, I got back to the grocery and realized that the door I entered and the door I exited were on different sides of the building. So I went to the front door, and from there it was easy. Crisis averted. I only had a handful of sites I wanted to be sure to get to, and otherwise just wanted to wander through the historical area. 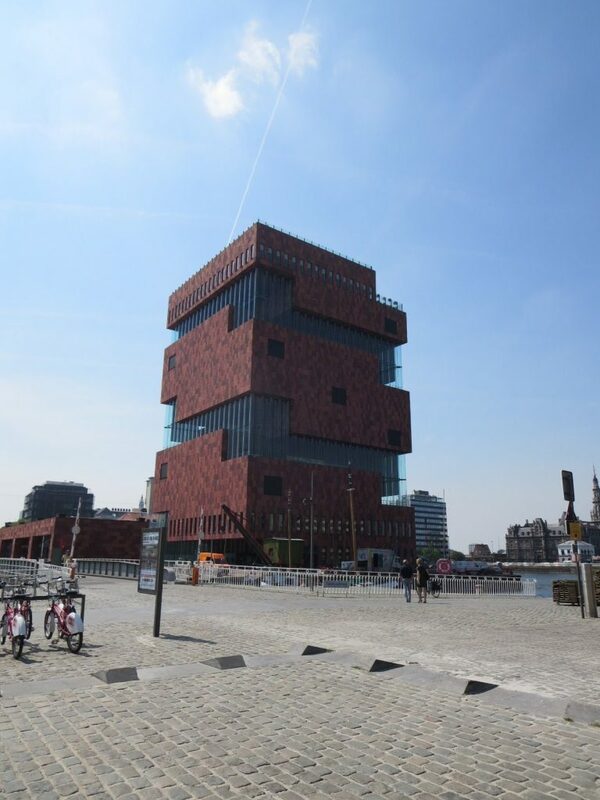 The Red Star Museum told the story of human migration in general and then narrowed the focus to talk about the many people who left Europe via Antwerp to go to the United States and Canada. Although I’ve been unable to find any information about my grandparents (and I did a search while I was there but was unable to come up with anything), I like to think that this morning I walked where my grandmother or grandfather once walked. There were a lot of high school kids in the museum. In fact, wherever I’ve gone the last few days, I’ve run into hordes of school kids on various field trips. From there I went to the Museum aan de Stroom, not to go to the museum, but to ride ten flights of escalators to the roof to see the view, which wasn’t actually all that impressive. 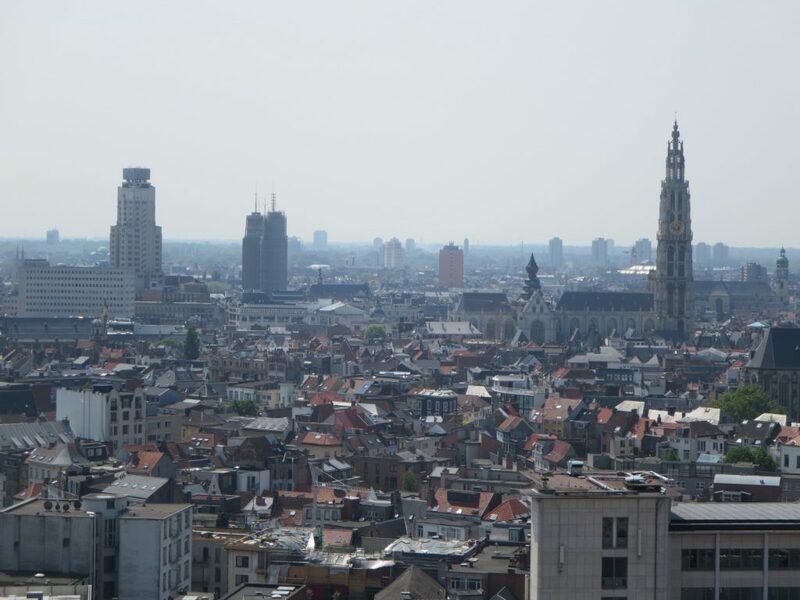 Antwerp is a great city, but not for reasons that a lot of tourists would be attracted to. Thinking more about why Bruges didn’t thrill me while I had a much greater affinity for Ghent and Antwerp is that Bruges felt like a place where everything is happening in service to tourists. But Ghent, and to an even greater degree, Antwerp feel like places where people live and work and that just happen to have delightful historic districts. I think Ghent has it over Antwerp, which has one big river but no canals and no cute bridges, and they haven’t done anything much to take advantage of the riverfront as part of the city. But nice cathedral and cool looking castle (on the outside; it’s just a shell and there’s nothing inside). Great shopping district, and the Rubens house was interesting to see. I have come to realize I am not a fan of Rubens, and I’ve now seen a lot of his work. Everything was very walkable, but there was no time for the other museums I wanted to see. Still, my enjoyment of this city was mostly just wandering the streets and enjoying the atmosphere. Tomorrow I head to Delft, but I’m planning on stopping in Rotterdam (since I have to change trains there anyway). I’m looking forward to Dutch painters. View my Antwerp photo album.